During the threat that the planet Phaaze presented to the galaxy, it is verified that a number of biological contagients known as Leviathan Cores were sent out to various parts of the universe. The purpose of these Leviathan Cores was to smash into the surface of a target world and infect it and its biosphere with large quantities of Phazon ore to prepare the planet for “Phazon-forming”. Carried onboard the Leviathan was an independent Phazon Core which would be the center of such an undertaking, while the Leviathan would unleash the initial Phazon the Phazon Core would continue the creation of new Phazon, turning the target planet in time into a new Phaaze like living world. Once a Leviathan had infected a planet with Phazon it would live on for several more hours during which it would look for a strong native predator which it would enthral with Phazon and mutate into a Guardian of the Phazon Core. The reason for the Leviathan taking on the form of an indigenous predator is a simple one. In order to reign over the local lifeforms it was important to take the form of an organism that was already at the top of the food chain. As time was a precious commodity, it would only make sense to take on the form of a predator whose physical characteristics were already proven in that selected enviornment. But now Federation scientists speculate that sometimes a Leviathan does not come across a strong enough native predator or the predator does not prove to be strong enough to survive the Phazon mutation. In these cases it is theorized that the Leviathan undergoes a new life phase. Instead of dying off, it alters its own body to become a Guardian itself while the Phazon Core becomes a part of its structure. The Metroid Prime is believed to be such a Leviathan-turned-Guardian, having never found a suitable, indigenous lifeform which to assimilate. Apparently these creatures possess some form of DNA imprinting capability, perhaps to help them better adapt to the new home planet. When the body of a Leviathan Guardian becomes unstable it seeks out the nearest lifeform with Phazon in its body in order to absorb its DNA and to assume a new form. In Samus Aran’s case with the Metroid Prime a rather unusual result seemed to take place. In its death struggle the creature it had found in it's perception the top predator upon Tallon IV: Samus Aran. When the Metroid Prime used both to create a new body it gained intelligence regarding how to understand and use technology and evolved into a creature that would later be called the Dark Samus. 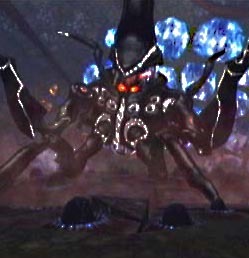 In it's original form the Metroid Prime relied mostly on melee attacks and its sheer size, but while being held captive by the Space Pirates the Metroid Prime absorbed a number of weapon systems when it escaped confinement, these were absorbed into its armor and the Metroid Prime could using them during combat. The Metroid Prime had absorbed such weapons as a Power Beam like weapon, a Wave beam, Ice beam, and a weapon similar to Plasma beam. The Metroid Prime could launch these in a direct projected energy beam but it could also generate orbs holding the charge of a particular weapon. The Metroid Prime had also absorbed a snare beam confinement field generator which it used during combat to drag opponents to it. While it was held captive the Space Pirate scientist discovered that the Metroid Prime was developing defensive fields specifically attuned to resist Pirate weaponry. Though the fields were weapon specific for now the scientist feared that the Metroid Prime would develop a defense field that could protect it from all kinds of weaponry, rendering it invulnerable. In its pure Phazon form the Metroid Prime relied upon ramming attacks and generating energy shockwaves, it also gained the ability to render itself invisible in certain spectrums, forcing Samus to switch to alternate vision modes. Last the Metroid Prime not initially finding a suitable predator to take the form of instead came across a small group of escaped Tallon Metroids. Seeing the potential in the creatures, it immediatly began to create phazal replications of the organisms which would be later known as Fission Metroids. The exact reason why the Space Pirates and Samus Aran’s suit concluded that the Metroid Prime was a Metroid is not exactly known, but as the Metroid Prime relied on Phazon energy for sustenance it may have developed organs similar to a Metroid’s energy draining organ. The Metroid Prime poses something of an enigma to the Galactic Federation science community as information about it is severally limited because of its rarity. So far only one live specimen was encountered by the Space Hunter Samus Aran on the planet Tallon IV and most of the information on the species is based on what facts where gathered during that confrontation though Samus Aran did later encounter a deceased specimen on the planet Phaaze in what she referred as the Leviathan womb. This last could prove to be vital to determine the Metroid Prime’s exact genealogy and its place in Phazon connected species. 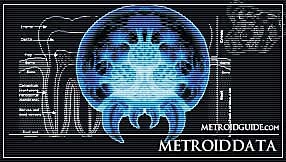 After Samus Aran shut down a Space Pirate operation to mine and apply Phazon mutagen on the planet Tallon IV a number of scientific and military reports were recovered with details about the Metroid Prime, Samus Aran herself also provided a number of scans she took of the creature and the different life phases it too shamed during her battle against it. Original reports and scans indicated that the Metroid Prime was a lifeform that was genetically most similar to the Metroids of SR388 although on a highly evolved scale. It was gestating near the impact crater of the celestial object that had brought Phazon to Tallon IV and had contaminated its biosphere with, there the Metroid Prime kept consuming large quantities of Phazon ore to replenish its life energy with it, but it in turn also generated new Phazon on its own. While mining for Phazon the Space Pirates had come across the Metroid Prime, and as they were interested at the time of using Metroids for the purpose of warfare they captured the creature for study. The creature seemed to resemble a large Terran arthropod somewhat, it had a large black armored multi legged from that was very different from the more jellyfish like Metroids (this was before the science community learned of the different life phases Metroids native to SR388 go through), not seeming to posses the ability to move through the air like them. One distinct feature was a somewhat human like face hidden beneath what was to assumed to be the head’s armor plating, something else that is very different from normal Metroids which never develop such a ‘facial’ form during their lives. Unlike other Metroids it did not take sustenance from what the Space Pirate defined as ‘life energy’, instead relying solely on Phazon for sustenance. This made the Metroid Prime rather hard to control; as soon as it was deprived of Phazon it became violent, seeking to escape its confines with force. 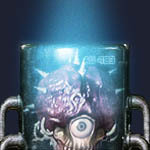 When a large piece of Phazon ore was transported to the laboratory where the Metroid Prime was kept for study, it fought its way out of the containment tube to consume the Phazon. Several security forces attempted to stop the creature but were rapidly dispatched by it, curiously the Metroid Prime to assimilated their security force's weaponry into its own form during that struggle. This later would lead to the creatures knowledge to particular types of beam weaponry. The Space Pirates were able to recapture the creature but because of the great security threat it posed it was decided to lock the Metroid Prime up in the Phazon mines near the meteor crater until more effective means to control the creature had been devised. Samus Aran later encountered the creature when she entered the impact crater through a gateway the ancient Chozo of Tallon IV had provided. While searching for the core of the meteor the Space Hunter encountered the Metroid Prime in a central chamber where it was consuming large quantities of Phazon. When Samus stirred it, the creature escaped into a series of chambers that led to the center of the meteor where it challenged Samus to several fights before she wounded the Metroid Prime severally enough for it to retreat into this final chamber. There Samus Aran encountered the Metroid Prime’s true form which had been developing inside the arthropod body, a multi tentacle free floating form which was made up of pure Phazon. Although the creature resembled a Metroid now far more there were still a number of differences that set it apart, it maintained the human like face from its first form, capable of expressions such as anger and it had internal nuclei far more complex than a normal Metroids such as a very large brain structure. This might indicate that the Metroid Prime was actually an intelligent lifeform, capable of complex thought. After Samus had caused enough injuries to the Metroid Prime it seemed to loose control of its Phazon form, reverting to what could be described as its main essence; the internal nuclei covered in Phazon based tissue. As it was very weak in this form it immediately searched out for the nearest stable form that contained Phazon energy which in this case was Samus Aran in her Phazon Suit. It tried to pull Samus into its body by pulling onto the Phazon in the Power Suit, no doubt in an effort to possess her, in order to escape Samus was forced to shed her Phazon Suit which was immediately absorbed by the Prime’s core. By now the creature had lost any control of its form and it was rapidly expanding and becoming dangerously unstable, some sort of connection must have existed between the meteor core and the Metroid Prime because at the same moment the meteor also became unstable and started to collapse upon itself, forcing Samus Aran to evacuate the core. After the collapse of the asteroid somehow most of the Phazon on Tallon IV had become inert and useless to the Space Pirates, with only limited quantities of the ore lingering around. This last fact is rather important as it took place after the defeat of the Metroid Prime, suggestion a connection between the two that could only be explained later during the “Phazon Corruption” Crisis nearly a year later.